The purpose of this portfolio is to present my skills and experience to the Graduate Program of Counseling at Seattle University. I have taken a wide variety of courses in my undergraduate work here at Seattle University that have helped me to expand my understanding of the psychological processes and influences that contribute to an individual’s personality. Additionally, I have both work and volunteer experience with adults and children. In my work as a server, I have honed my ability to work with a wide range of people and personalities, and have honed my skills in mediating between providers and clients. In my volunteer work as an elementary school tutor, I have gained experience working with children individually and in groups to assess their academic skills and abilities to determine ways to help them develop critical reading, writing and math skills. I believe that the Seattle University Counseling Graduate Program will enhance my therapy and counseling skills to help me achieve my final goal of becoming a licensed counselor. I am excited about the opportunity to gain further experience in, and hone my therapeutic skills through the Seattle University Counseling Program in the Graduate which I was able to learn about through the Seattle University official website. I am currently a Junior Psychology major at Seattle U. My volunteer experience with adults and children that I have accumulated since freshman year aligns well with the desired skill set for this program. I have taken a wide variety of course work at Seattle U that has helped me to develop proficient writing and communication skills, such as a couple of English courses and writing classes focused on developing writing skills specifically tailored for Psychology. Additionally, I have taken many classes that have expanded my understanding of what contributes to the human personality, such as Growth and Development, Cognitive Psychology, Theories of Personality and Multicultural Psychology. I believe that these courses have provided me with a strong foundation for a future in counseling. As a tutor and a server, I have gained experience in working with all kinds of people. My work as a server has taught me skills in mediating between clients and the company to come up with solutions to ensure the satisfaction of all parties. I have worked with elementary school children to assess their strengths and weaknesses in the areas of reading, writing and math to help develop and hone those skills to prepare them for a successful future in academia. I believe that with my course work as an undergraduate Psychology student and my work and volunteer service will make me a strong candidate for the Graduate Counseling program. I look forward to putting the knowledge I already possess into practice and further expanding my knowledge of Psychology and counseling. I can be reached at [email protected] or 540-878-0471. I look forward to hearing from you soon. Provide fast, friendly service to hundreds of customers nightly. Oversee 8-15 tables simultaneously per shift in a fast-paced environment. Handle up to $1,200 per night in sales. Handled and efficiently bathed a wide range of small and large dog breeds and cats. Provided crisis management assistance to other groomers for particularly aggressive animals to establish a calm and safe environment for both groomers and animals at all times. Supply Clerk Fulfilled supply orders for over 600 Embassy personnel. Created a catalogue for all supplies available to Embassy employees. Maintained daily inventory of supplies available. Maintained and organized files for over 600 Embassy personnel. Organized and labeled supplies daily in exam rooms. Created flyers and posters for ways to prevent the spread of germs causing the flu and proper techniques for sanitation. Improved reading score for my student by 3 grade levels in 2 months. Facilitated in the passing of 16 levels of math in 2 months. Established a comfortable, safe learning environment for four underprivileged students. Created a fun and safe learning environment for up to 15 elementary students at a time. Assisted in improving skills for reading, writing and math. Below are several papers composed during my undergraduate work at Seattle University. All papers are relevant to the field of Psychology and Counseling, as they have expanded my knowledge of the factors that influence the development of individual and collective personality. The following is an excerpt of a literature review paper I wrote during my Junior year at Seattle University. This assignment required extensive research and analytical skills to assess the literature on this topic. 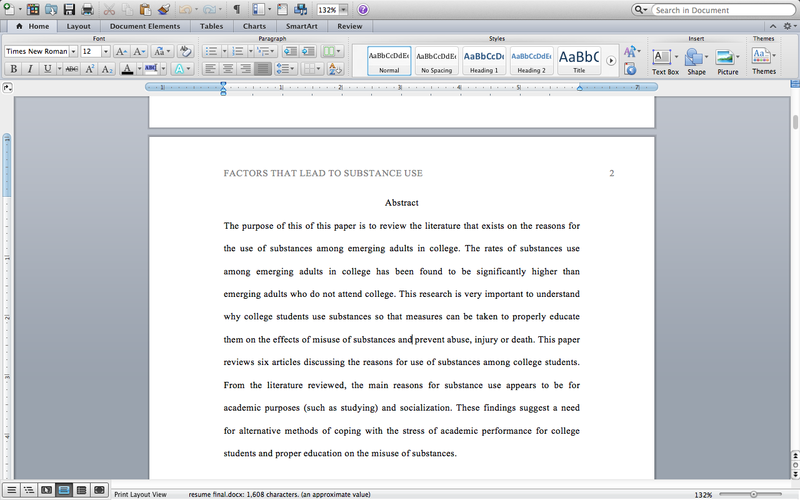 The topic was on factors that influence the use of substances of emerging adults in college. It has been found that substance use increases significantly during the college years and working on this paper has helped me to gain a better understanding of the developmental period of emerging adulthood, and why, specifically, this age range uses substances at a greater frequency than any other developmental stage. The complete document can be found in the appendix, A.1. 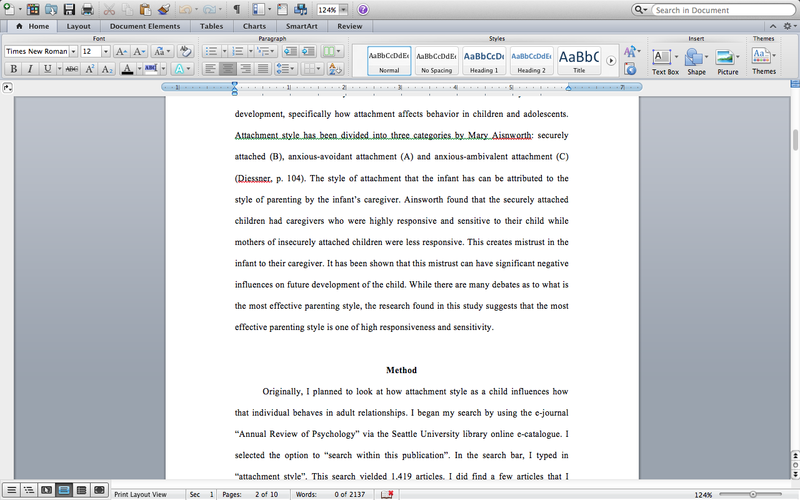 The following is an excerpt of an APA-style research paper I wrote during my sophomore year at Seattle University. Attachment plays a crucial role in the development of the individual throughout the lifespan. The individual research I found on this topic has helped me to gain a greater understanding of the earliest influences of personality, which will help me in the future to provide effective counseling to clients. The complete document can be found in appendix, A.2. 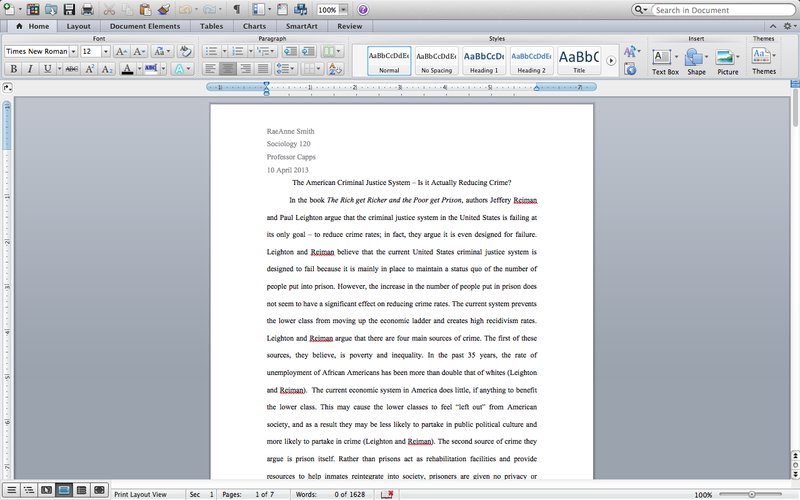 Below is a paper I wrote during my Freshman year at Seattle University. Environment plays a huge role in the development of personality. While our justice system is meant to protect the majority in society, according to the research I have found, the current system in place may actually foster criminal behavior. This is extremely important information, because as Psychologists, we must aim to discover and create an environment that will promote the healthiest development of the individual, to create a healthy society. The complete document can be found in appendix, A.3. The following excerpt is a paper composed during my Junior year at Seattle University. 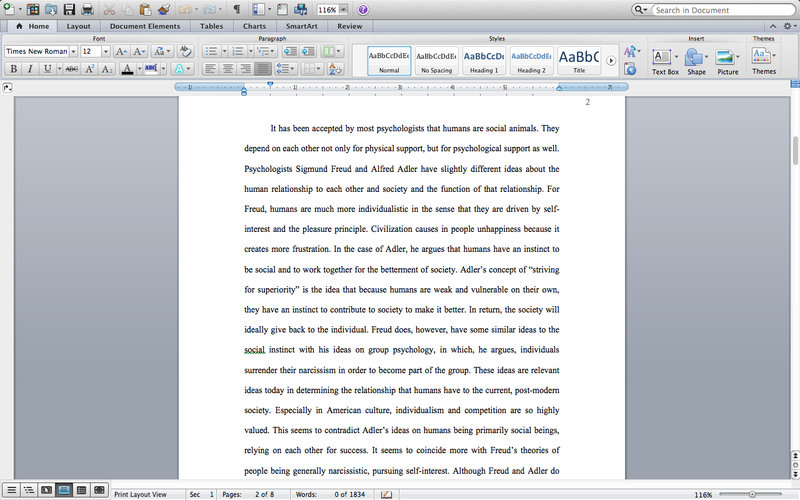 The paper is an individual research paper comparing psychologists Freud and Adler's theories on the individual's relationship to society. To be a successful counselor, it is crucial to have an understanding of the existing theories on different aspects of personality. The complete paper can be found in appendix, A.4.